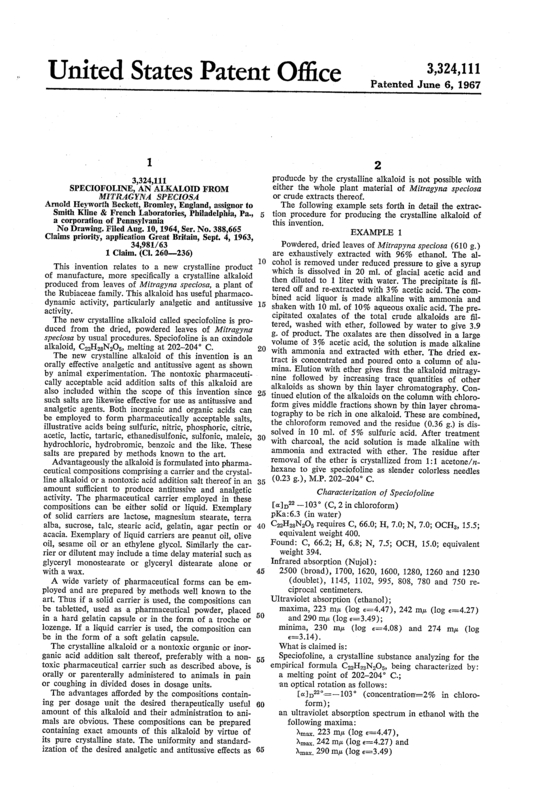 United States Patent 3,324,111 SPECIOFOLINE, AN ALKALOID FROM MITRAGYNA SPECIOSA Arnold Heyworth Beckett, Bromley, England, assignor to Smith Kline & French Laboratories, Philadelphia, Pa., a corporation of Pennsylvania No Drawing. Filed Aug. 10, 1964, Ser. No. 388,665 Claims priority, application Great Britain, Sept. 4, 1963, 34,981/ 63 1 Claim. (Cl. 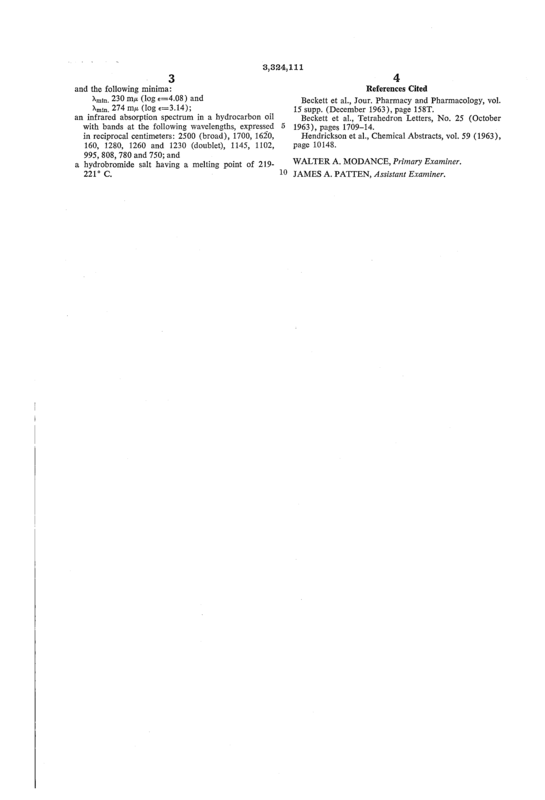 260236) This invention relates to a new crystalline product of manufacture, more specifically a crystalline alkaloid produced from leaves of Mitragyrva sp eciosa, a plant of the Rubiaceae family. This alkaloid has useful pharmacodynamic activity, particularly analgetic and antitussive activity. 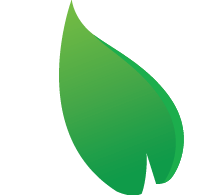 The new crystalline alkaloid called speciofoline is produced from the dried, powdered leaves of Mitragyna Speciosa by usual procedures. Speciofoline is an oxindole alkaloid, C H N O melting at 202-204 C.
The new crystalline alkaloid of this invention is an orally effective analgetic and antitussive agent as shown by animal experimentation. The nontoxic pharmaceutically acceptable acid addition salts of this alkaloid are also included within the scope of this invention since such salts are likewise effective for use as antitussive and analgetic agents. Both inorganic and organic acids can be employed to form pharmaceutically acceptable salts, illustrative acids being sulfuric, nitric, phosphoric, citric, acetic, lactic, tartaric, ethanedisulfonic, sulfonic, rnaleic, hydrochloric, hydrobromic, benzoic and the like. These salts are prepared by methods known to the art. Advantageously the alkaloid is formulated into pharmaceutical compositions comprising a carrier and the crystalline alkaloid or a nontoxic acid addition salt thereof in an amount suflicient to produce antitussive and analgetic activity. The pharmaceutical carrier employed in these compositions can be either solid or liquid. Exemplary of solid carriers are lactose, magnesium stearate, terra alba, sucrose, talc, stearic acid, gelatin, agar pectin or acacia. Exemplary of liquid carriers are peanut oil, olive oil, sesame oil or an ethylene glycol. Similarly the carrier or dilutent may include a time delay material such as glyceryl monostearate or glyceryl distearate alone or with a wax. A wide variety of pharmaceutical forms can be employed and are prepared by methods well known to the art. Thus if a solid carrier is used, the compositions can be tabletted, used as -a pharmaceutical powder, placed in a hard gelatin capsule or in the form of a troche or lozenge. If a liquid carrier is used, the composition can be in the form of a soft gelatin capsule. The crystalline alkaloid or a nontoxic organic or inorganic acid addition salt thereof, preferably with a nontoxic pharmaceutical carrier such as described above, is orally or parenterally administered to animals in pain or coughing in divided doses in dosage units. The advantages afforded by the compositions containing per dosage unit the desired therapeutically useful amount of this alkaloid and their administration to animals are obvious. 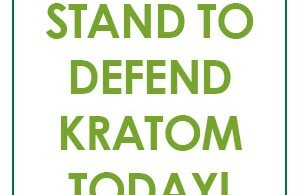 These compositions can be prepared containing exact amounts of this alkaloid by virtue of its pure crystalline state. The uniformity and standardization of the desired analgetic and antitussive effects as producde by the crystalline alkaloid is not possible with either the whole plant material of Mitragyna: speciosa or crude extracts thereof. The following example sets forth in detail the extraction procedure for producing the crystalline alkaloid of this invention. EXAMPLE 1 Powdered, dried leaves of Mitrapyna speciosa (610 g.) are exhaustively extracted with 96% ethanol. The alcohol is removed under reduced pressure to give a syrup which is dissolved in 20 ml. of glacial acetic acid and then diluted to 1 liter with water. The precipitate is filtered off and re-extracted with 3% acetic acid. The combined acid liquor is made alkaline with ammonia and shaken with 10 ml. of 10% aqueous oxalic acid. The precipitated oxalates of the total crude alkaloids are filtered, washed with ether, followed by water to give 3.9 g. of product. The oxalates are then dissolved in a large volume of 3% acetic acid, the solution is made alkaline with ammonia and extracted with ether. The dried extract is concentrated and poured onto a column of alumina. Elution with ether gives first the alkaloid mitragynine followed by increasing trace quantities of other alkaloids as shown by thin layer chromatography. Continued elution of the alkaloids on the column with chloroform gives middle fractions shown by thin layer chromatography to be rich in one alkaloid. These are combined, the chloroform removed and the residue (0.36 g.) is dissolved in 10 ml. of 5% sulfuric acid. After treatment with charcoal, the acid solution is made alkaline with ammonia and extracted with ether. The residue after removal of the ether is crystallized from 1:1 acetone/nhexane to give speciofoline as slender colorless needles (0.23 g.), M.P. 202-204 C.
Found: C, 66.2; H, 6.8; N, 7.5; OCH, 15.0; equivalent weight 394. 2500 (broad), 1700, 1620, 1600, 1280, 1260 and 1230 (doublet), 1145, 1102, 995, 808, 780 and 750 reciprocal centimeters. 160, 1280, 1260 and 1230 (doublet), 1145, 1102, page 10148. 995, 808, 780 and 750; and a hydrobromide salt having a melting point of 219- WALTER MODANcEPrlmary Examine”- 221 C. 10 JAMES A. PATTEN, Assistant Examiner. UNITED STATES PATENT OFFICE CERTIFICATE OF CORRECTION Patent No. 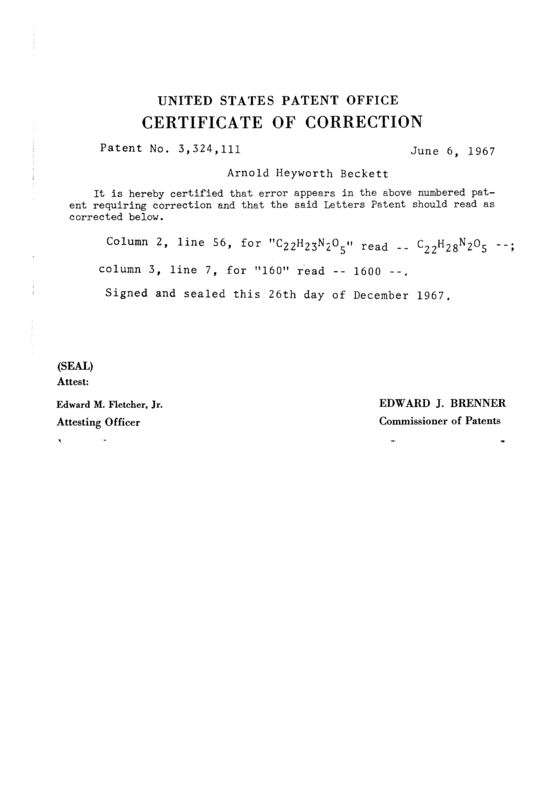 3,324,111 June 6, 1967 Arnold Heyworth Beckett It is hereby certified that error appears in the above numbered patent requiring correction and that the said Letters Patent should read as corrected below. Column 2, line 56, for “C 2 23 2 read y2 28 5 column 3, line 7, for “160” read 1600 Signed and sealed this 26th day of December 1967. EDWARD J. BRENNER Commissioner of Patents Edward M. Fletcher, Jr.